The Antarctic Ocean is removing tons of CO2- but at what cost? While some may celebrate a natural solution to the toxins admitted by our power plants and automobiles, others are concerned about just what this increased absorption means for the chemistry of our oceans. Earth has many ways of saving itself. CO2 levels are naturally balanced by absorption from plants and oceans. It is only recently, as mankind has thrown more and more greenhouse gases into the atmosphere, that Earth has been unable to correct itself. Aside from deforestation, the planet’s ability to bring balance to its atmospheric composition has been hindered by the oceans’ declining ability to absorb carbon dioxide. In the 1990s, the Southern Ocean around Antarctica, which plays a vital role in removing the warming gases from the air, saw its absorption rate fall by half. “The evidence that the sink efficiency was decreasing was a concern, because it means that carbon dioxide accumulates more heavily in the atmosphere,” said Bronte Tilbrook, who is a research scientist at CSIRO and the Antarctic and Climate Systems CRC. Yet today, scientists have reason to be optimistic. Studies show that in 2011, the Southern Ocean’s absorption rate has rebounded, sucking up as much as 1.2 billion tons of carbon- an amount equivalent to the EU’s annual output. 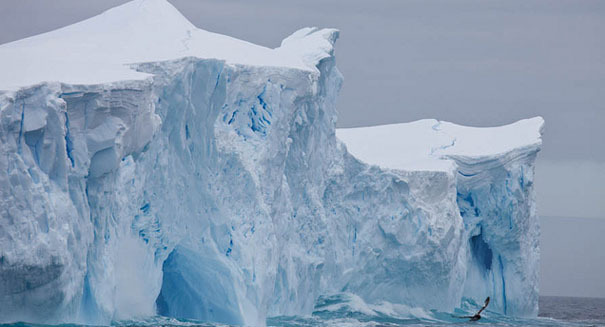 The reason behind the Antarctic Ocean’s increased activity is not entirely understood. However, researchers believe changing winds and temperatures have played a role. Oceans remove as much as 25 percent of all the carbon dioxide emitted by human activity. The Southern Ocean accounts for 40 percent of that figure. The currents circulating around the bottom of the world work like a drain, pulling the carbon from the surface and sending it deep underwater. “That sink has now re-established itself due to a change in weather patterns around an Antarctica. Long term, we don’t know how the sink will respond but we are getting an idea that its variability is much greater than we previously thought. It’s possible it may reduce again,” said Tilbrook. Trapping large quantities gases such as CO2 causes the oceans’ average temperature to rise. This leads to expansion and a rise in sea levels. Additionally, carbon dioxide increases the acidity of the oceans’ water. Today, sea water is 30 percent more acidic than it was in the early 1900s. While humans may not notice any difference while on their beach holidays, such changes are wreaking havoc among marine life, especially the most vulnerable creatures such as coral reefs and shellfish.